Political parties in Karnataka are gearing up for the first round of 2019 Lok Sabha elections in the state scheduled to be held on April 18. Top leaders from both sides, Prime Minister Narendra Modi and Congress president Rahul Gandhi, held rallies and election campaigns in various parts of Karnataka including Bengaluru. Fourteen constituencies, of the total 28, will go to the polls on April 18. The 14 constituencies, spread over the central and southern regions of the state, are Udupi-Chikmagalur, Hassan, Dakshina Kannada, Chitradurga, Tumkur, Mandya, Mysore, Chamrajnagar, Bangalore Rural, Bangalore North, Bangalore Central, Bangalore South, Chikkaballapur and Kolar. All the three constituencies in Bengaluru – Bangalore South, Bangalore Central and Bangalore North – will go to the polls on April 18. Around 72 voters in the city are going to cast their vote in this polls. The maximum number of candidates is 40 in Bangalore North and minimum 13 in Chamrajnagar. JD(S) supremo HD Deve Gowda's is hoping that if there is a fractured mandate at the centre, his coalition building skills and his son-of-farmer image might help him garner some support for a shot again at the PM's post. A food delivery executive for Swiggy, Jenifar J. Russel is one among 22 candidates battling the 2019 Lok Sabha elections from Bangalore Central constituency. 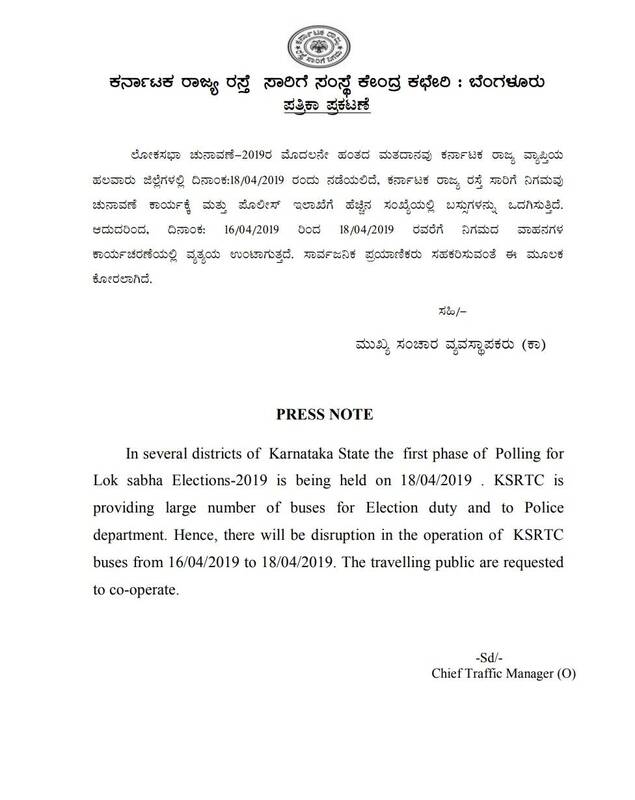 Disruption in the operation of KSRTC buses in Karnataka during Loksabha Elections. Tejaswini Ananth Kumar campaigns for Tejasvi Surya, Bangalore South BJP Candidate. Tejasvi took to Twitter of her campaign. The newly-appointed state vice president of BJP Tejaswini lost her ticket to Tejasvi Surya, sought votes for him. BJP State Vice President Smt @Tej_AnanthKumar joins me for a road show in Hosakerihalli. Karnataka Congress demanded a probe into the alleged transportation of a "suspicious black trunk" in Prime Minister Narendra Modi's helicopter during his visit to Chitradurga, Karnataka for campaign recently. To an interview to PTI, former Karnataka Chief Minister Siddaramaiah said, "The country was heading towards a coalition government as neither the Congress nor the BJP are unlikely to get an absolute majority despite claims by political leadership." Speaking to a television channel, Karnataka BJP chief, Yeddyurappa said that BJP was confident of winning 22 seats out of 28 seats in Karnataka and also he says it would be a tough election for senior Congress leaders like Malikarjun Kharge and K H Muniyappa. Voters in Karnataka will not be allowed to carry smart-phones or mobile phones inside the polling booth on April 18. Use of phones will be banned within 100 metres of the polling station. According to EC, Mobile phones are not be allowed inside the polling booth is to prevent them from taking selfies or recording videos. Tejaswini Ananthkumar has clarified that she has not endorsed a campaign to vote NOTA in Bengaluru South constituency in the Lok Sabha elections. In social media, a poster asking people to 'vote NOTA in Bengaluru South to support Tejaswini Ananthkumar' was shared. Tejaswini Ananthkumar has responded on Twitter, "It came to my knowledge that somebody is spreading rumours that I am asking people to vote for NOTA. This is unfounded and malicious. For me, it's VOTE BJP Modi Again National First." The Election Commission has declared more than 1,600 polling booths in Bengaluru as critical. The District Electoral Officer for Bengaluru Urban, and the police department has picked the critical booths based on the guidelines from the Election Commission. Previous records of violence and tussles were considered while shortlisting the booths. Former India captain and Karnataka election ambassador Rahul Dravid will not be able to cast his vote on April 18 Lok Sabha Polls. The reason, Dravid got his name deleted from his old constituency of Indiranagar but didn't get his name added in the new constituency list before the March 16th deadline. Karnataka CEO Sanjiv Kumar said, "Dravid got his name voluntarily deleted and forgot to include his name after moving to a new house. It is legally not possible to include his name now." The Karnataka Congress has written to the Election Commission of India (ECI) seeking the transfer of Principal Chief Commissioner of Income Tax and Director General (Investigation), B R Balakrishnan, to ensure free and fair polls in Karnataka. This comes in the backdrop of recent IT raids on Congress and JD(S) sympathisers. Never before in the history of Karnataka, people have witnessed such brazen misuse of IT to intimidate & threaten political opponents. On Saturday, Prime Minister Narendra Modi addressed a public meeting in Bengaluru, Karnataka. He was being accompanied by top leaders of the party from the state. In his first rally in the city, Modi tried to woo voters from Bangalore Central, North and South, Bangalore Rural and Chikkaballapur constituencies.